A Virtual View Of A Slaughterhouse : 13.7: Cosmos And Culture Virtual reality can be wildly entertaining, but it also can inform us in hard-hitting ways about social justice issues, including those of animals, says anthropologist Barbara J. King. 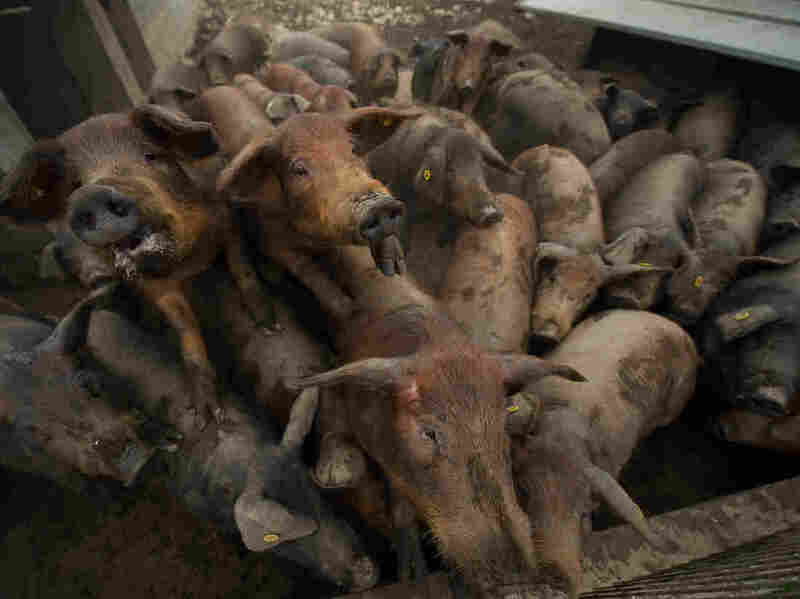 Pigs gather in a sty at the Sierra de las Villuercas processing plant in October near Deleitosa, Spain. Editor's Note: Some may find the graphic descriptions in this post disturbing. When I walked into my first virtual reality experience last week at Sundance Film Festival, there was no movie theater or screening room to enter. It consisted only of a single, rotating desk chair and a virtual reality (VR) headset sitting on a table. I settled into the chair and, with the help of Sharon Nunez and Jose Valle of the organization Animal Equality, strapped on the headset. For the next 12 minutes, I immersed myself in the world of iAnimal, a 3-D VR presentation co-produced by Animal Equality and Condition One that's focused on a factory farm and pig slaughterhouse in Mexico. When I emerged, I found I couldn't get words out to ask the questions I had prepared. My throat felt thick, stopping my voice, as tears welled. I hadn't known what to expect. At first, I flubbed it: I sat facing forward, looking at images of pigs, rows and rows of pigs, confined in tight stalls on a factory farm. The scene was disturbing but familiar. What I was seeing felt like a traditional documentary film. Then I heard Sharon's voice at my shoulder: "Feel free to move around, Barbara." And it finally clicked: I was meant to use the chair to pan the 180-degree arc from my left to my right to take in the screen images fully. Suddenly, it wasn't a traditional film experience anymore. As I watched and twisted slowly back and forth, two pigs were driven roughly up a chute, where they stood against a barrier, side by side. A slaughterhouse worker drove a metal bolt stunner into their skulls. Both pigs went rigid and slumped. I had just witnessed the moment of their deaths, I thought. But I was wrong. The pigs soon regained some degree of consciousness. Their limbs in spasm, their bodies jerking on and on and on, they were bled out slowly on the slaughterhouse floor. In VR, you are there with them, at no remove, with no distancing mechanism available. You can't avoid what comes next, when the next pair of pigs is forced up the slope. Trapped there, the other pigs lock eyes on what is happening so near them, to others just like them. I can't responsibly suggest that pigs anticipate their own deaths but, based on the science of pig intelligence, I do think that the pigs in this situation feel an extreme fear — taken from the sights and sounds and smells assailing them — that something terrible is about to happen to them. Valle appears in iAnimal, both at the beginning and the end of the film. He asks us not to turn away from the animal suffering and he praises the "courageous" act of those viewers who stick it out the whole 12 minutes. I'm glad Valle acknowledges how hard it is to watch — and I should mention that both he and Nunez were incredibly kind to me when the presentation ended. But I didn't feel courageous. I felt disoriented and stupid. I have watched, read and taught about animal suffering in factory farms before. I knew it was bad in factory farms in the U.S., England, Europe, China and Latin America. Yet, something extra-powerful comes across in VR. The heightened visual closeness brings about heightened emotional attunement and, thus, the true extent of the cruelty to individual, sentient animals. I'm not claiming here, nor is Animal Equality claiming in the presentation, that all pigs suffer in precisely the way that those two in the film did. Valle estimates that, based on his personal experiences filming undercover in 14 slaughterhouses, the stunning procedure may fail in about half the cases, leaving a pig conscious until it finally dies. Paul McCartney's famous comment goes like this: "If slaughterhouses had glass walls, everyone would be a vegetarian." The take-home point here, though, doesn't have to do with exactly how many of us would go vegetarian or vegan if we could see inside a slaughterhouse — or view iAnimal — any more than it has to do with exactly how many pigs remain conscious after they are stunned. It's that we need to see and stop what we're doing to other animals — and not only in the last few moments of their lives. As The New York Times editorial board wrote in a hard-hitting piece published Monday, "Factory farm operators believe that the less Americans know about what goes on behind their closed doors, the better for the industry." But aided by film, and especially by VR, we do know. And, so, we can refuse to buy meat from factory farms. We can, as Valle says, "make compassionate choices, either opting for a plant-based diet or reducing [our] consumption of meat." The VR images, a week later, linger behind my eyes.